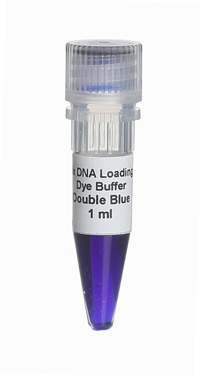 6x DNA Loading Dye Buffer Double Blue can be used for loading DNA samples (PCR products, restriction fragments) on agarose or polyacrylamide gel. In 1% agarose gel Bromophenol blue comigrates with ~300 bp (1 x TBE) or ~400 bp (1 x TAE) fragments and Xylene Cyanole FF comigrates with ~3500 bp (1 x TBE) or ~5000 bp (1 x TAE) fragments. 07-02-00001 1 ml PDF PDF PDF 3 EUR Login to buy! 07-02-00010 10 ml PDF PDF PDF 30 EUR Login to buy!